By focusing on the enterprise, the BlackBerry Passport has become the most popular 'Berry handset in years. The 4.5-inch screen features a 1440 x 1440 resolution. The wide, box-shaped screen makes it easier for users to read reports, spreadsheets and emails without having to continuously move the content back and forth on your smartphone screen. BlackBerry calls this "Work Wide," and it seems to have won over quite a few companies and businessmen. If you are a BlackBerry Passport owner, you might be interested in some official BlackBerry accessories for the device. The BlackBerry Passport Leather Flex Shell doubles as a tough protective case, and a stand. It comes with a screen protector that will keep your screen from getting scratched. The Leather Flex Shell and the screen protector can be purchased from U.K. retailer Clove for the equivalent of $28.27 USD. The accessory is expected to start shipping early next month. Clove is also offering the BlackBerry Passport Modular Sync Pod, also priced at the equivalent of $28.27 USD. So what does this Pod do? It keeps your Passport charged and synced to your PC or laptop. The Pod comes with a micro USB connector and a 3.9-foot USB cable. While using the Pod, you can still navigate around your phone, create documents and even use BBM video chat. Keeping your phone fully charged means that you are always ready to get plenty of work done in the field. 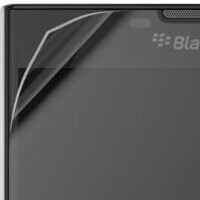 The U.K. retailer is also offering the the official BlackBerry Passport Screen Protector. Priced at the equivalent of $14.30 USD a package, there are two screen protectors in each package. If you are a businessman using the Passport on the go, you are going to want a way to protect that luscious screen from an inadvertent scratch. This accessory is available to be shipped now, and just might save you from having a stroke. Since the BlackBerry Passport has turned out to be so popular, we wouldn't be surprised to see some more official accessories down the road. If any of the above strike your fancy, you can order them from Clove by clicking on the sourcelink below. Nice accessories. The modular sync pod may be somewhat of an overkill for the BlackBerry Passport, considering its stellar battery life and it's ability to use BlackBerry Blend, but hey, one never knows. Now, my passport needs a Sync Pod so at night I put my phone in Bedside Mode.. Awesome..